Given that I just did a post on Gazpacho a few weeks ago, a tomato soup recipe may seem redundant. Besides the tomatoes though, this soup couldn’t be more different. Those hot and humid evenings may have only been a couple of weeks ago, but fall seems to have arrived without hesitation here in New York. It’s as if Mother Nature looked at a calendar and scheduled the cooler weather immediately as August ended. 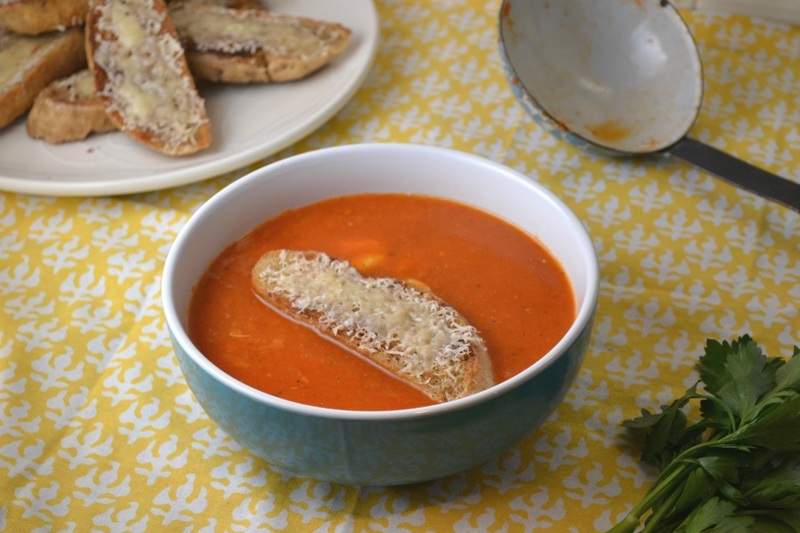 These chilly evenings call for soup, and this unpublished fresh tomato soup recipe struck me as the perfect way to use up some of the delicious ripe tomatoes leftover from summer. The most intriguing part of this recipe is the addition of a raw egg. Cracked directly into the serving bowls, the hot soup cooks the egg just enough so the yolk remains runny. This of course requires the soup to be very hot when served and the serving bowls to be warmed (throw them in the oven for a minute restaurant style or cheat and use the microwave). 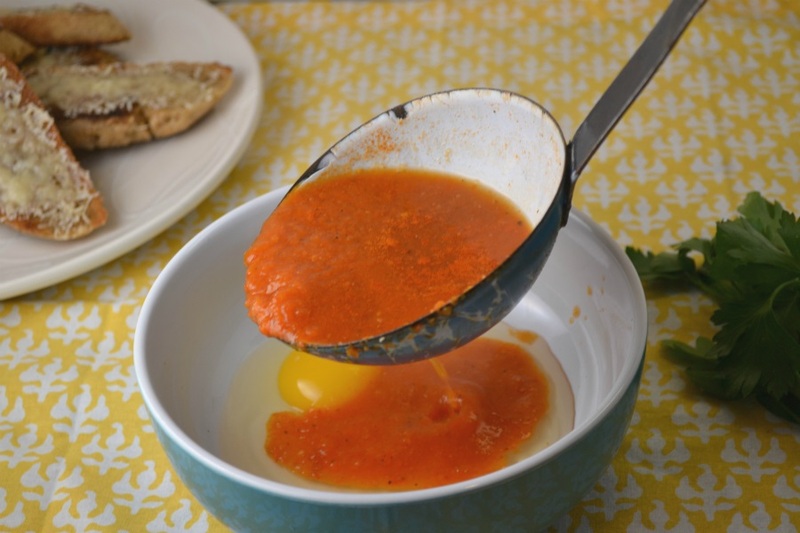 The runny part of the egg can then be enjoyed with not just the soup, but a large parmesan crouton – the other jewel of this dish. Slices of crusty bread are sautéed in butter until toasted and crunchy, then topped with grated parmesan cheese, and briefly browned under the broiler. Each bowl of soup is then topped with a slice..or two. It seems my grandmother had yet to name this recipe because the faded typewriter written version just reads, “Another Tomato Soup, But Very Good” – the “another” referring to an unpublished recipe for a non-vegetarian or beef tomato soup that she also wrote. I considered coming up with a fancier name that would hint at the unique addition of an egg and the large crusty parmesan croutons. However, those can always be excluded and the basic soup is perfectly satisfying on its own or with good old grilled cheese. Heat the olive oil in a large, heavy-bottomed pot over medium-low heat. Add the onions and saute for about 10 minutes, until very tender. Add the garlic and cook for 1 minute. Add the tomato paste, tomatoes, salt, sugar, basil, pepper and stock and stir well. Bring the soup to a boil, lower the heat, and simmer, uncovered, for 30 to 40 minutes, until the tomatoes are very tender. While the soup simmers, prepare the parmesan croutons. Preheat broiler. Heat butter in a large skillet over low heat. Add baguette slices. Saute a few minutes on each side until lightly browned. Remove croutons from heat and place on a baking sheet lined with parchment paper. Sprinkle croutons with cheese. Place under broiler just until cheese melts. When tomatoes in soup are tender, remove from heat. Blend by using an immersion blender or by transferring soup to a blender, a few cups at a time. Return to pot, check seasoning, and bring to a boil. Return to a simmer until ready to serve. Heat serving bowls. Crack an egg in each bowl. Ladle soup into bowls, allowing it to “cook” the egg. Top with parmesan crouton. Serves 6 small bowls or 4 large.